Whole Grain Wheat, Sugar, Corn Meal, Whole Grain Oats, Corn Syrup, Wheat Flakes, Rice Flour, Salt, Refiners Syrup, Honey, Oat Flour, Brown Sugar Syrup, Corn Starch, Natural and Artificial Flavor, Brown Rice Flour, Canola Oil, Malt Syrup, Color Added, Trisodium Phosphate, Natural Almond Flavor. Vitamin E (Mixed Tocopherols) and BHT Added to Preserve Freshness. Vitamins and Minerals: Calcium Carbonate, Vitamin C (Sodium Ascorbate), Zinc and Iron (Mineral Nutrients), Vitamin E Acetate, A B Vitamin (Niacinamide), a B Vitamin (Calcium Pantothenate), Vitamin B6 (Pyridoxine Hydrochloride), Vitamin B2 (Riboflavin), Vitamin B1 (Thiamin Mononitrate), a B Vitamin (Folic Acid), Vitamin A (Palmitate), Vitamin B12, Vitamin D3. 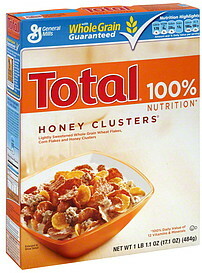 Contains wheat, almond; may contain milk and walnut ingredients.